Are you curious to find out the best things to do in Foligno? Our mini-guide will show you the best things to do, typical foods to eat and places to visit in Foligno! The third largest city of Umbria, situated halfway between the most famous Perugia and Assisi , Foligno is an excellent destination to discover! But what are the best things to do in Foligno? Foligno is located on flat land , which makes it pleasant to visit the city by bike or on foot. To get to the heart of the city of Foligno we recommend you follow the path of the Topino river and heading in Piazza della Repubblica, where you can enjoy the unique architectural ensemble consisting of Duomo, Palazzo Comunale and Palazzo Trinci. The Cathedral, dedicated to San Feliciano, the patron saint of the city, is neo-baroque style. Do not miss inside the Diocesan Cathedral Museum and Crypt of San Feliciano. Take a visit at Palazzo Trinci, home of the Art Gallery. Completed in 1407 and renovated in 1949, it has a neoclassical façade and a magnificent Gothic scale . Inside the Council Hall with times , the walls frescoed by Piervittori and a huge stone fireplace in the '500. Adjacent to the palace is located Palazzo Orfini, former home of Emiliano Orfini , the printer who printed the first edition of the Divine Comedy in Italian. One of the best things to do in Foligno is visit the Municipal Library in the Piazza del Grano. The church of San Giacomo, made in the Gothic style in 1402 and placed in the square, is characterized by red and white stripes , a portal and a cloister. In Largo Carducci we mention the Oratory of Nunziatella dated 1492, where you can admire a work of Perugino depicting the "Baptism of Jesus " and the " Eternal Father " and a tabernacle work of Nicholas Lattanzio Pupil . If you are wondering what to do in Foligno after walking so much , we suggest a stop at Parco dei Canapè, a park which is a place of recreation and relaxation surrounded by a part of the ancient walls between Porta Romana and Porta Todi. 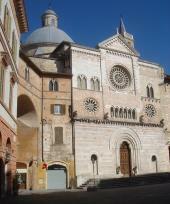 There are offers for vacation rentals and hotels in the areas of Foligno! Click and Consult them immediately. What are the best things to do in Foligno if you have more time? Just 6 miles from downtown there is Sassovivo Abbey, a Benedictine monastery founded around 1070. Our mini guide on what to do in Foligno suggests you to take a ride to the Italian Center for Contemporary Art, container and promoter of artistic activities focused on creativity . Our miniguide can't finish without telling you what are the best things to eat in Foligno! The typical local dishes are based on traditional Umbrian cuisine linked to the products of the earth like mushrooms , beans and truffles, together with good wine and the inevitable extra virgin olive DOC ! 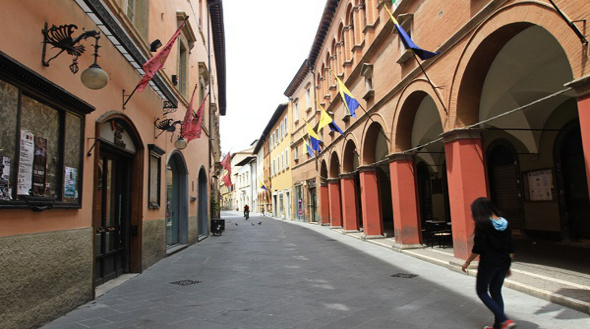 See the best restaurants in the area of Foligno! >> Click here and book. Throughout the year, but preferably in June and September during Giostra della Quintana, you will have the opportunity to taste typical medieval dishes in the taverns. We also recommend a ride to the nearby countryside, where you can taste and buy local products directly from local farms . 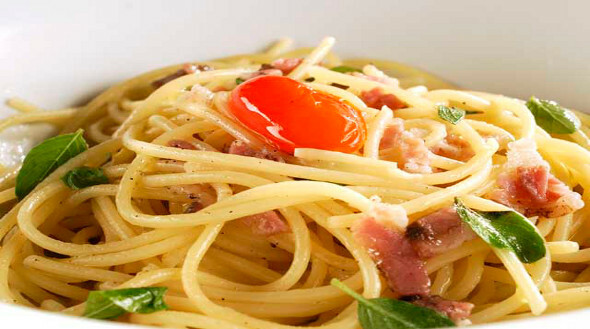 An Umbrian typical first course to try is spaghetti al rancetto, with bacon, tomatoes and marjoram which gives spaghetti a unique scent and flavor. A typical dessert is Rocciata, which is similar to a sweet apple strudel, enriched by nuts and cocoa. Its salted version is represented by the Fojata, made with cabbage leaves . If you've decided to visit Foligno and taste the delicious Umbrian cuisine you should contact now Farm-Houses near Foligno >> click this link.